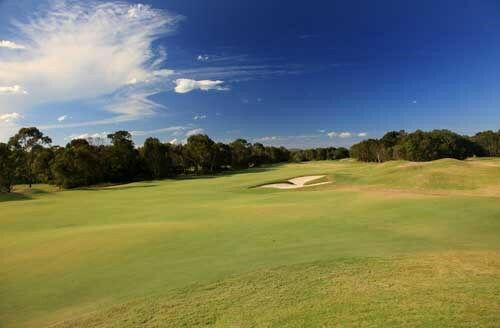 For the avid golfer, there are some amazing golf courses set in amongst the beautiful surrounds on the Sunshine Coast. 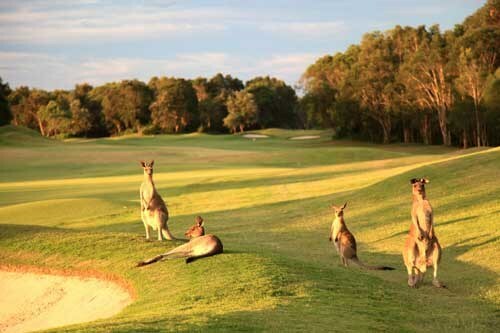 In being one of Australia's favourite tourist destinations it is also identified as one of the very best golf regions as well, and has great weather to match! 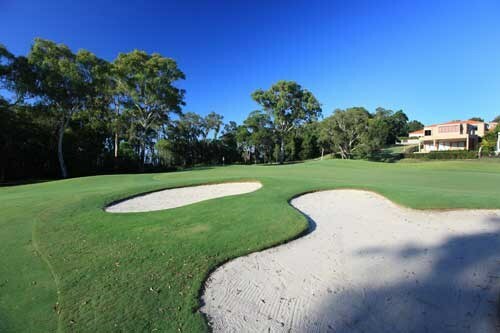 The Sunshine Coast is home to a magnificent series of golf courses that include Noosa Springs, Club Pelican, Twin Waters, Pacific Harbour, Palmer Coolum and many more courses. 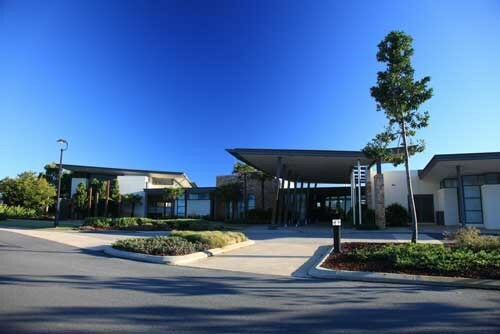 Arrive at Sunshine Coast Airport. Zanzibar Resort Apartments is close to everything your heart desires including shopping, elegant restaurants and sidewalk cafes. The perfect setting for relaxation. Indulge in the latest fashions and giftware from around the world in the surrounding boutiques. 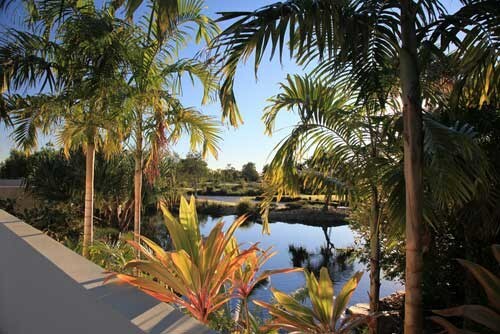 Return transfers are included between accommodation and golf. 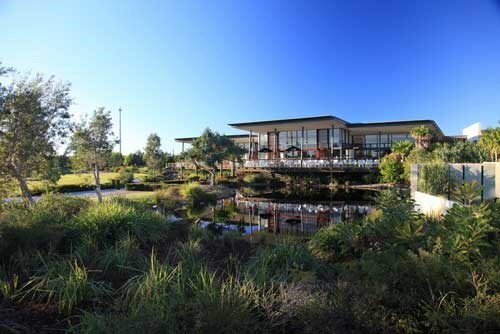 Twin Waters Resort, was designed by five times British Open champion Peter Thomson and partner Mike Wolveridge. 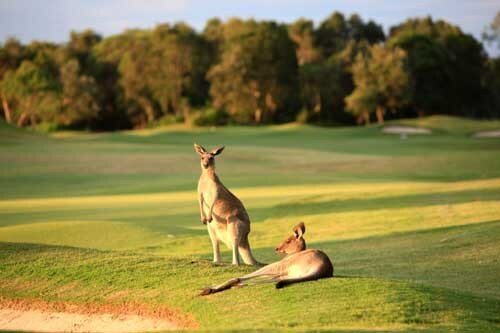 The 18 hole, par 72 championship course is internationally recognised as one of the top ten resort courses in Australia. 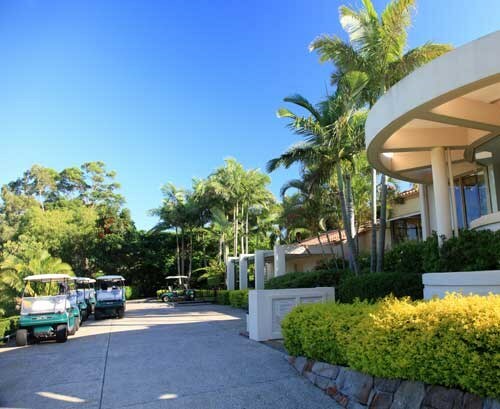 The stunning setting and challenging layout nestled amidst the tranquil bushlands of the Sunshine Coast. 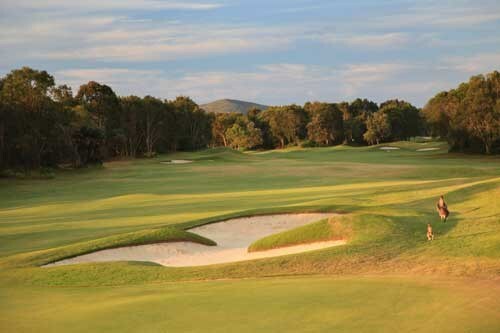 Noosa Springs, carved out of Noosa's stunning landscape, this course does what all great courses do. It challenges you. It invites you to think, then decide. It's beguiling, and beautiful. Creative, and captivating. 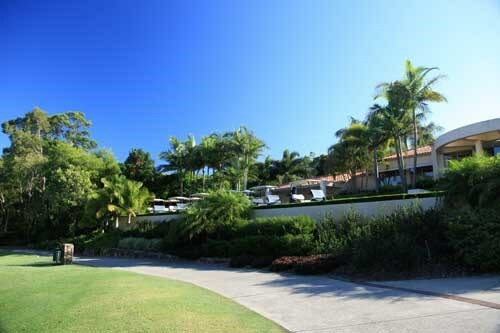 Pacific Harbour is an island paradise centred around a unique 18 hole championship course and a superb subtropical style golf and country club. 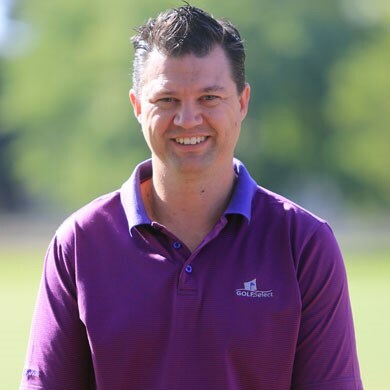 Course architect, Ross Watson, much admired for his work on Palm Meadows, Robina Woods and Royal Sydney, has conceived Pacific Harbour as a temptation for casual golfers and professionals alike. All the key characteristics of a world-class course are present: a great layout that tracks the terrain naturally, challenging design and memorable holes, framed by beautiful landscaping. The course also meets strict environmental guidelines for low impact. 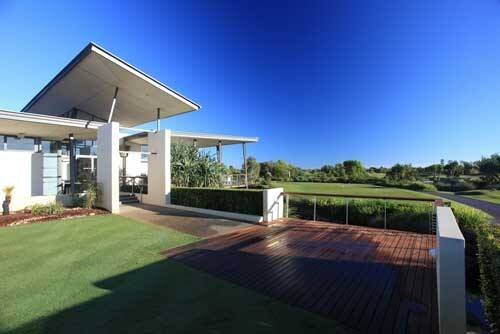 Distinctive features include interconnecting bodies of water and beach bunkering, seaside style shaping, mirrored lakes, wetlands, wildlife corridors and a well thought out landscape of native flora. 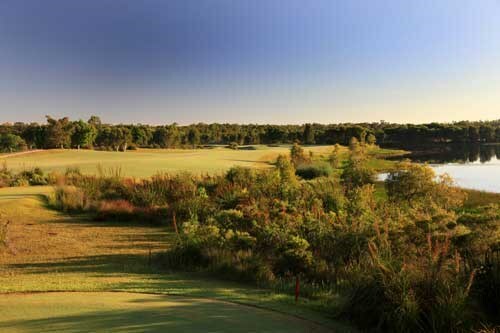 Pelican Waters GC, exclusively designed by Greg Norman, this 18 hole championship course is arguably one of the finest, most challenging and rewarding courses in Australia. 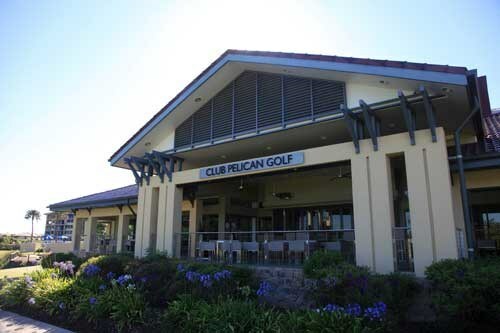 Boasting impeccably manicured bunkers, greens and fairways, and a world class driving range and short game practice facility, it guarantees golfers of all levels a truly exhilarating and memorable experience. 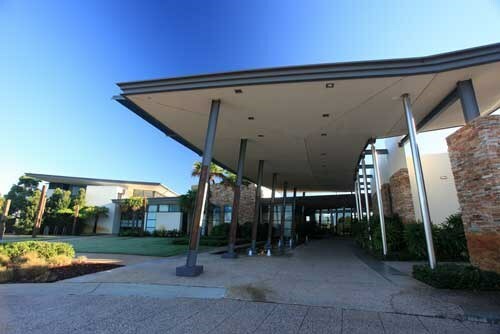 Transfer to Sunshine Coast Airport. 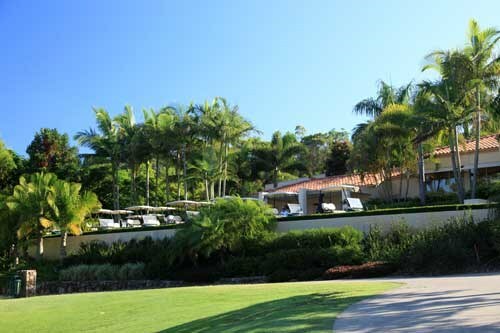 Rated in the top 12 Stay and Play Resorts in Australia (Australian Golf Course Guide 2010), Noosa Springs Golf & Spa Resort is the perfect place for a couple’s escape or a golf getaway for individuals, families or groups. 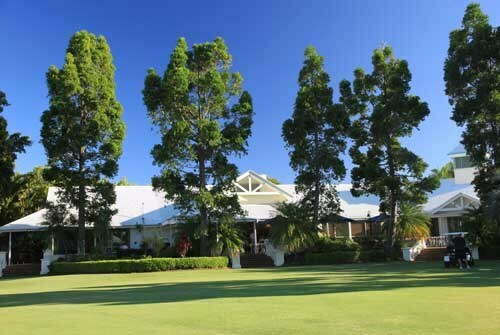 The Golf Course forms a significant part of the Noosa Springs Golf & Spa Resort, representing a destination within a destination. 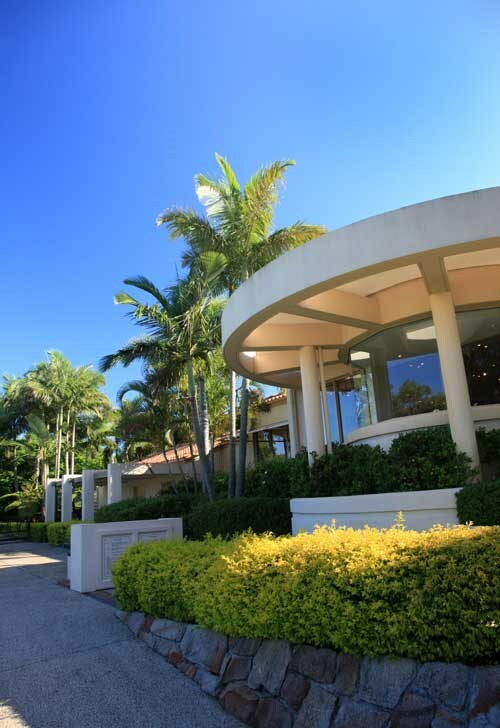 It is a locally owned and operated luxury boutique style resort with supreme leisure facilities, situated in the heart of Noosa Heads. 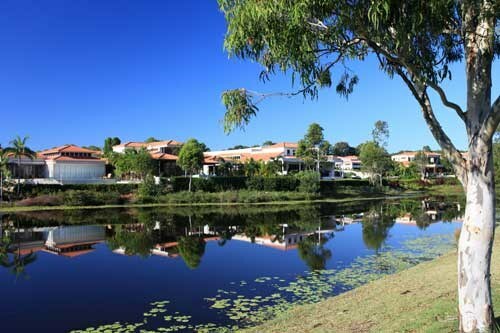 Surrounded by picturesque Lake Weyba and Noosa National Park it provides a relaxing haven, only three minutes from Hastings Street and famous beaches. 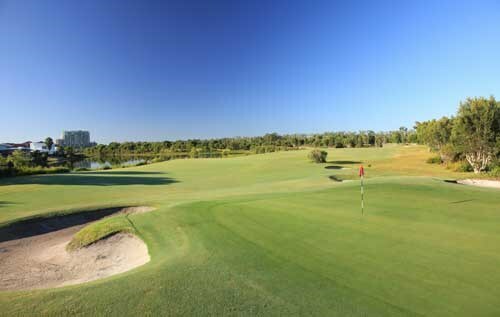 Pacific Harbour is an island paradise centred around a unique 18 hole championship course and a superb subtropical style golf and country club. 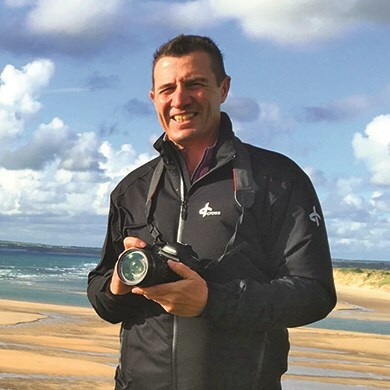 Course architect, Ross Watson, much admired for his work on Palm Meadows, Robina Woods and Royal Sydney, has conceived Pacific Harbour as a temptation for casual golfers and professionals alike. 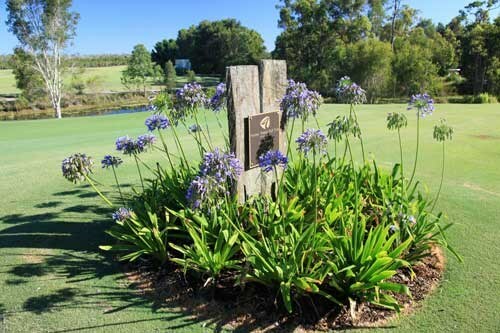 All the key characteristics of a world class course are present : a great layout that tracks the terrain naturally, challenging design and memorable holes, framed by beautiful landscaping. A gentle starting hole. A good drive aimed slightly right of the trap on the left will leave a perfect position to approach the green. Longer hitters can take on the bunker on the left and with success will leave a long iron to the green. A lay should be positioned short of the bunker on the left to allow the full length of the green to be used for the approach shot. The tee shot is intimidating because of the water along the left of the fairway linking up with beach bunkers near the green. A smart decision from the tee is to play the shot aligned to the left edge of the right fairway bunker allowing the terrain to capture the roll of the ball to end on the fairway cut. A cautious player may decide to leave the driver in the bag and play for position with an iron. The distance from the bunker to the small (520 m2) undulating green is only 100m. The green presents many varying slopes increasing the degree of difficulty when putting. Be aware of the pin placement and the approach gradients. Do not be aggressive with your putt as a birdie opportunity could result with a bogey score. A tough driving hole with bunkers left and right, trouble on the left. The longer hitters will take on the bunker on the right, with success giving opportunity to go for the green in 2. A perfect tee shot should be aimed at the right edge of the bunker on the left. Your lay up should be positioned to the left centre of the fairway keeping away from the bunker positioned 100m short on the right. Be sure to place your 3rd shot on the same level as the flag for an easy 2 putt. When standing on the tee check the wind or light breeze direction. Most golfers will have to play a tee shot with a fairway, hybrid woods or a long iron. It will be important that if the prevailing south-easterly to southerly wind blows, the tee shot should be aligned towards the right bunker to open up the front entrance to the green. This line of play will hopefully keep the ball clear of the 30m long bunker that skirts the virgin wetland. Playing the hole into a north-easterly summer breeze will require the player to choose the right club selection to reach the green. 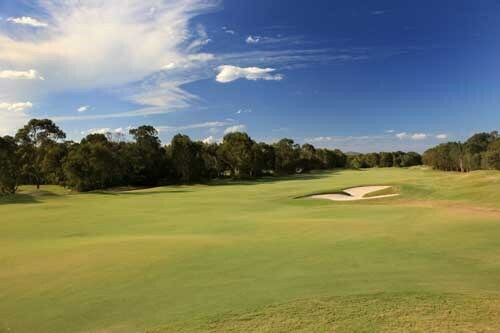 The gentle undulating green has a depth of 35 meters which may present some long range putts to achieve a birdie. The 2nd hardest hole on the course. A perfect tee shot should be aimed just left of the bunkers on the right, will leave a 2nd shot of about 160m from the centre of the fairway. Club selection is the key for the 2nd shot. Avoiding the bunkers to the left of the green is a must. The best place to miss this green is short and right for a chip shot straight up the green. Aim the tee shot in the direction of the cluster of bunkers in the far distance that are situated to the right of the green. This line of play gives the best approach to the green for the second shot. The second shot will generally play downwind. In front and to the left of the green there are several hollows trapping the short hit approach to the green. The ultimate challenge for the approach is to finish on the same level as the pin placement. 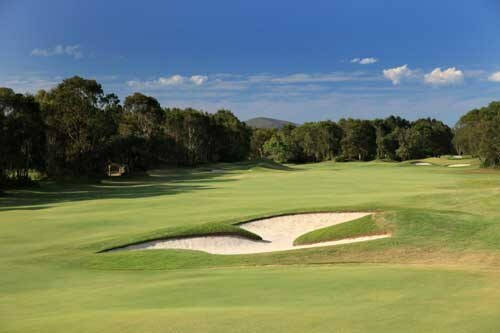 Once familiar with the severe slope on the green the player should conquer this hole by knowing where to land the approach shot and subsequent roll of the ball to the pin. 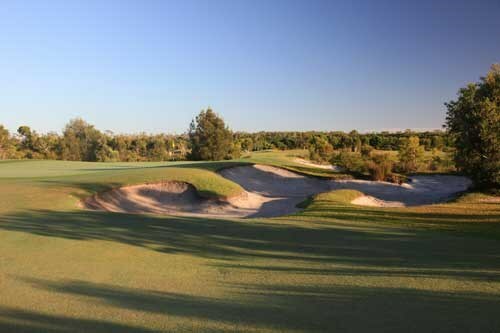 My favourite hole on the golf course! From the black markers it measures 145m, with every last meter of it over water, with the green reminding me of the famous island green at Sawgrass. Into a prevailing south easterly wind, the hole plays 2 to 3 clubs longer. The bail out area is short and left on this hole but club selection is vital. 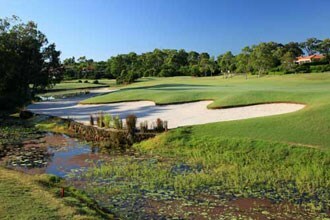 The wide lens/landscape fairway sweeps to the right with a lateral water hazard ever present from the tee to the green. Line up the tee shot because the shot will not have to carry the water hazard to the green. If the hole is on the lower tier the player should be cautious with the putt from the higher level as a putt hit too firm may roll off the green. A perfectly played tee shot up the left hand side of the fairway not only avoids the fairway traps on the right but also gives you a look at the green. Your approach shot needs to be accurate but a shot missed left rather than the deep bunker on the right will leave an easier up and down. 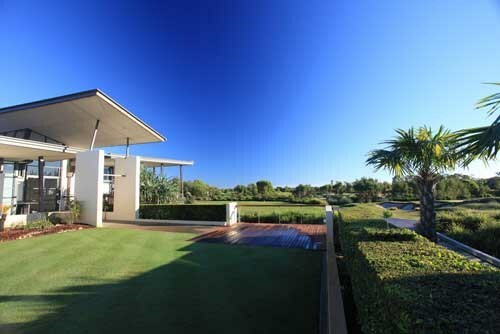 The tee box is in the foreground to the ambience of the relaxed atmosphere of the clubhouse. The tee shot appears to be a shooting gallery with 4 majestic bunkers positioned left into the slight undulating terrain of the fairway. For the best entrance to the green the tee shot must stay just left of a right fairway pot bunker. The green is angled to the right and well guarded by a very deep bunker on the right and the left bunker frames the narrow entrance to the green. A very strong PAR 5. A perfect tee shot should be aimed just left of the fairway trap on the right of the fairway. Once the tee shot has been negotiated a decision has to be made whether to lay up short of the bunkers 100m from the green or to take them on and leave a pretty simple pitch and putt. 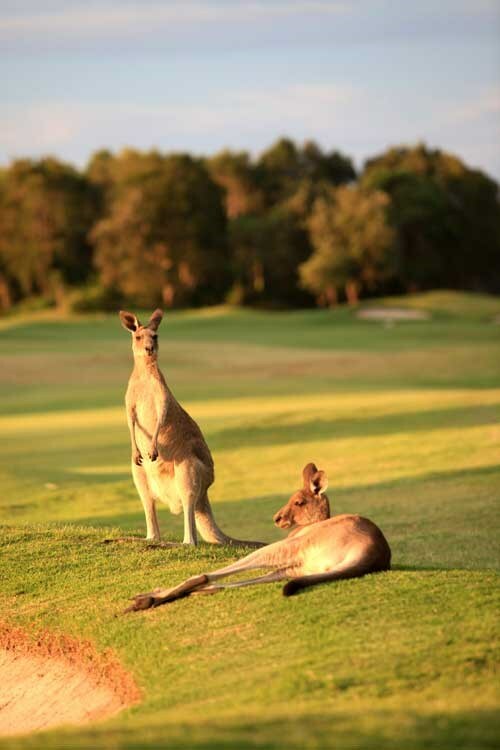 If you are laying up, be sure to leave your favourite yardage into the green. Standing on the tee it appears to be a straight-away hole. Visible from the tee is a pot bunker that is 35 meters in front of the green which gives a focus line of play threading through the foreground bunkers on the right and left of the fairway. 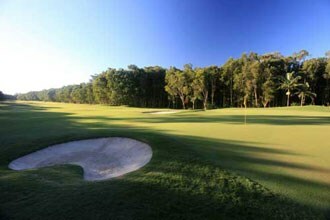 Playing to the smallest green (460 m2 28m X 18m deep) requires a high approach shot to hold the perched green. A great short PAR 3. This hole requires an accurate approach from the tee to a very small green. Ideally the way to play this hole is to aim it at the bunker short of the green which is located in the centre of the green. A shot turning right to left a little too much will catch the slope and roll onto the wetland. Take the centre of the green and 2 putts and go to the next. The beauty of the hole especially when playing into a setting sun will be stunning. Line up to a far distant bunker left of the greenside for a good target line. 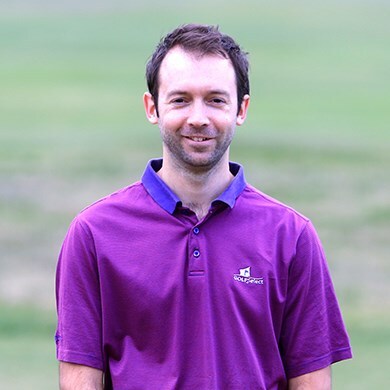 Ninety percent of golfers may need to lay up for the second shot because of the wee burn crossing the fairway 30 meters out from the green. When the hole placement is a right position, play left of the flag because the slope from the edge of the green may take a ball hit right of the pin down to the lateral water hazard. Such a tough hole. Depending on the wind a driver or fairway metal from the tee to avoid the bunkers left and right. Once you negotiate your tee shot a mid to long iron to a large sloping green is required. Be sure to leave your approach shot on the correct tier of the reen to leave an easier 2 putt PAR. 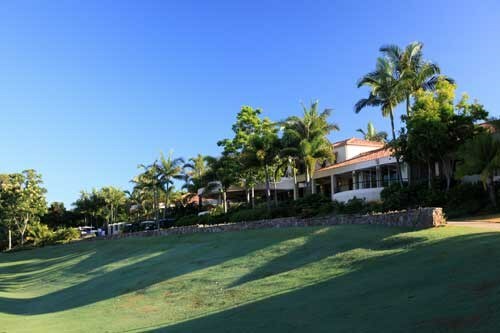 With the beautiful backdrop of the clubhouse and pandanus trees it is a short hole that will reward the golfer with PAR. Play for a position as near as possible to the fairway bunkers. There is an intimidating water hazard that encroaches on the right front portion of the green. Play the shot with caution with line of play left centre of the green. 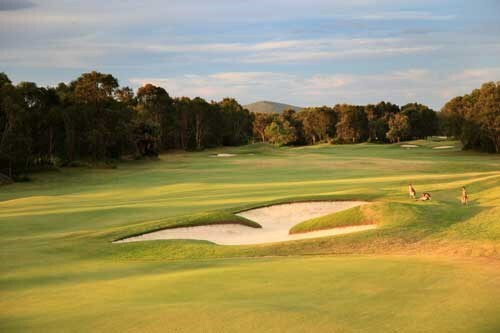 The longest PAR 3 on the course with the longest bunker in the Southern Hemisphere. Depending on the wind direction and location of the flag you may need every bit of the club in your bag and more! Or it could be nothing more than a 5 or 6 iron. Aim your shot to the left centre of the green to allow the ball to feed off the contour to the centre of the green. Once again find the centre of the green 2 putts and run to the next tee. 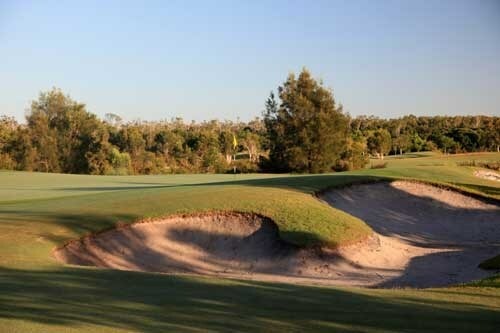 A wide landing, sweeping, rolling fairway beautified by the natural bush land to the left and to the other side a beach bunker lapped by the mirror lake. 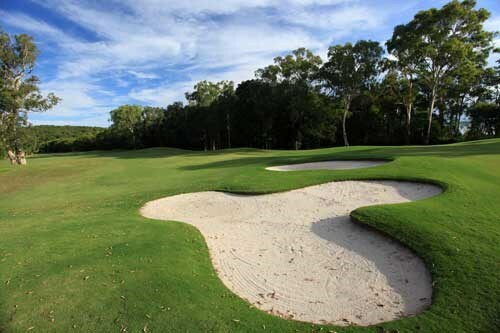 Avoid the beach bunker and play for additional distance from the contours of the fairway. For safety and protection of a good scorecard play to the left portion of the green especially when the pin placement is near to the water. 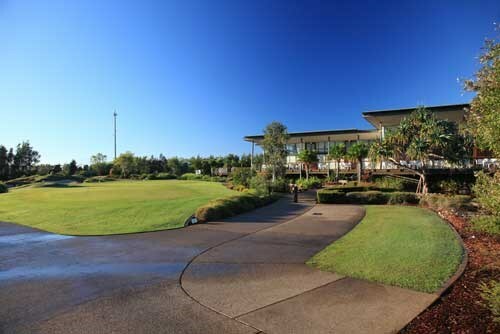 Pelican Waters Golf Club, exclusively designed by Greg Norman, is an 18 hole championship golf course that is arguably one of the finest, most challenging and rewarding courses in Australia. 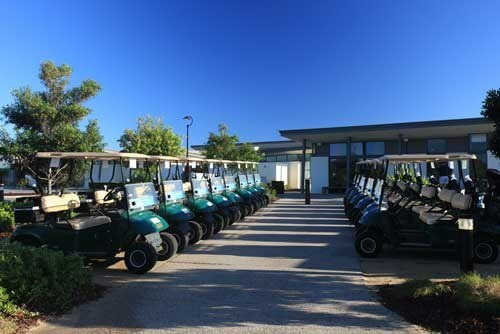 Boasting impeccably manicured bunkers, greens and fairways, and a world class driving range and short game practice facility, it guarantees golfers of all levels a truly exhilarating and memorable experience. This is a tough opening hole and the longest hole on the course. A birdie is difficult, with a very difficult green. A bump and run approach will give the shortest possible birdie putt. All the trouble on this par 3 is on the right side. A safer approach is from the left side this will offer an easier chip and putt. A long par 4 with a difficult approach and a par on this hole will be harder than it looks and well earned. A genuine par 5 where you must keep the ball in the fairway. Longer hitters will attempt to reach the green in two but the bunkers will catch the wayward shots. This short hole looks easy but has a difficult element in the green's slope. Undulations and slopes make approaching this green difficult. Another short hole with the water starting to come in to play on the left side of the fairway. Once in the fairway a deceptive approach shot makes for a well earned par. A picturesque par 3 where club selection is paramount. 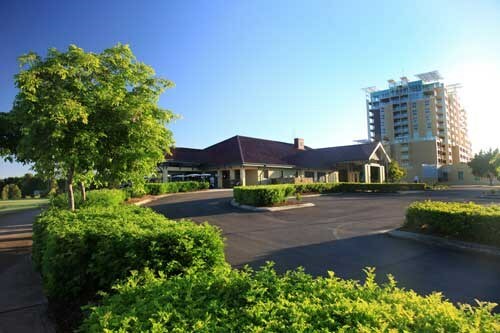 If you do not land on the green with your tee shot, your short game will be tested here. The signature hole on the course with the green design in line with the "road hole" at the famous St Andrews. The water on the right is very intimidating and should be steered away from. A long par 4 with bunkers and mounds guarding wayward tee shots both left and right. A green with a large area on the left side to play to for safety. No need for length off the tee on this hole but watch the slightly raised green to catch your approach shot. A real birdie chance! All the trouble on this par 3 is short, with the green elevated at the front. A shot falling short will test anyone's short game. The wind will also be a deciding factor in club selection. Try to stay out of the bunkers on this hole, as there are 10 in total. 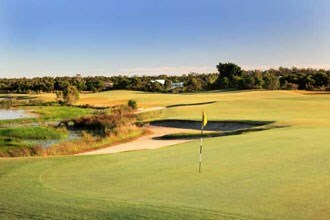 A short par 4 but you will need to be on the fairway to par this hole. A strong par 4 that dogleg's to the left and with water on the left hand side as well, it will need to be kept away from. The green has several levels and you will need to be on the right level to make a par on this hole. The wind on this par 5 will determine how difficult this hole plays. Beware of the blind fairway bunkers near the green. A real birdie chance! A fairway that looks inviting to a big drive, but needs to be kept in the fairway to get the best approach into a narrow but long green. A hazard and bunkers on the right side catches any wayward tee shots. This green has a distinct tier in it so putting will be difficult if you are on the wrong level. The toughest par 3 on the course and in certain wind conditions may need your strongest drive. An area short left may give you an easier chip and putt. A par here and you will have hit 3 good shots. A par 5 where the more aggressive player may reach it in two shots and set up a birdie. 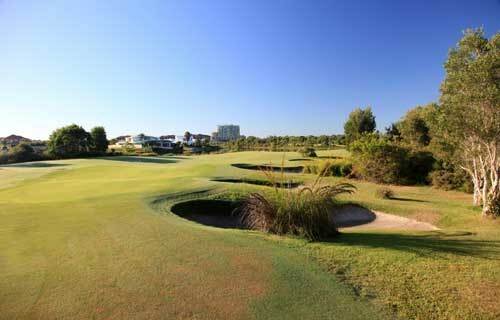 Avoid the bunkers off the tee and also near the green and you will be in a good position to par this finishing hole.